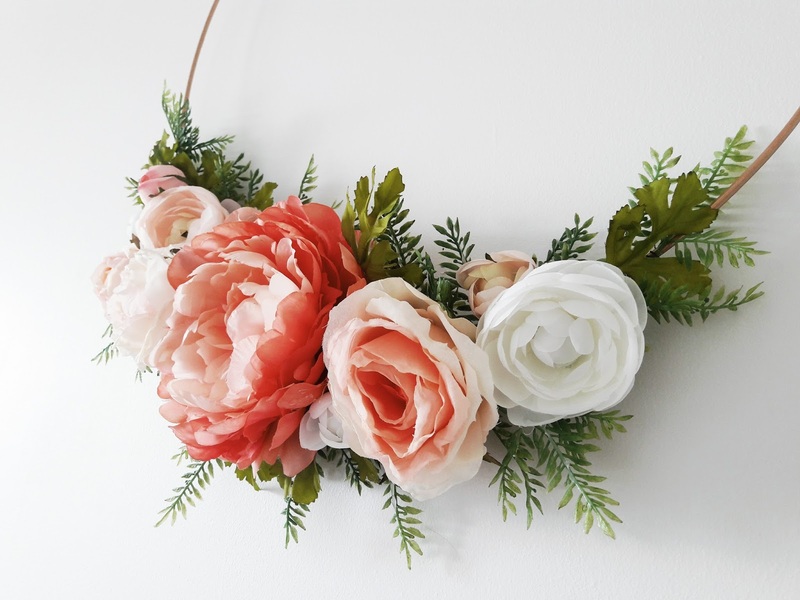 So, to bring spring to myself I made a floral wreath hoop. Remove your flowers and greenery from stems. Some pop right off while others you will need to use the wire clippers on. Make sure to remove any plastic or wire right down to the base of your flower so you can apply it as evenly as possible to your wreath. Spray paint your hoop if desired. The floral hoop I found originally came in a gray silver color. I knew I wanted a gold hoop so I added a thin coat of gold spray paint and let it dry. You can leave it gray or spray paint it any color you'd like. Once the hoop is completely dry, play with your flowers and greenery until you achieve the arrangement you desire. I took a quick picture for reference and then removed the floral from the wreath. Starting with the greenery, place one stem at a time on the hoop and secure by wrapping the floral wire around the stem and hoop several times. Repeat overlapping the stems until you have the coverage and look you want. Starting with the largest flowers place a large circle of glue at the base and place it on top of the hoop and secured greenery. Hold in place for a few seconds while the glue drys to secure it in place. Continue with the medium flowers and fill in any spaces or gaps with the smallest flowers. I wanted to add in more greenery so I used the leaves that came on my ranunculus stems and added them behind the flowers with hot glue for a layered look. I used the glue gun to secure the flowers to each other and neighboring greenery for more security. I love this craft because it is so versatile. You could use it for a wedding, baby shower, birthday party or room decor. You can also add a lot of personality to it by customizing it with a hoop color and florals of your choice. Seeing these soft pink spring flowers in my house has definitely made my happy even if they are fake and the weather is still fickle in Utah. 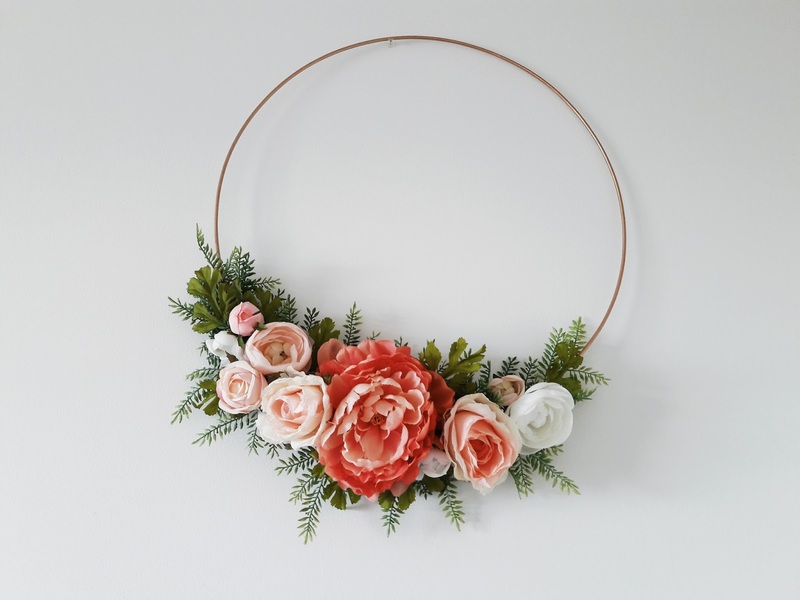 What would you use a floral hoop for?